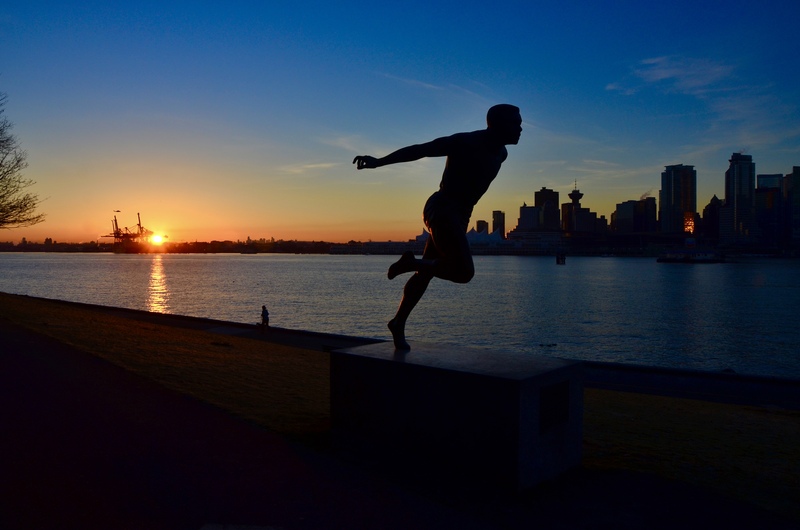 04 Dec Best Place to Photograph Sunrise in Vancouver BC? For most of the year, it’s just too damn early to get up and out in time to get good sunrise photos. But the winter is a different story. While in Vancouver, B.C. last week, I noticed on my phone that sunrise wasn’t until around 7:30 a.m. Now that is what I call a gentleman’s sunrise hour, one late enough to tempt all but the most die-hard night owls. I Googled “Best Places to Photograph Sunrise in Vancouver,” and “Where to Photograph Sunrise in Vancouver,” but found no real consensus on where to go. A number of bloggers suggested Grouse Mountain, but I wanted something in the city, so I ventured out to Stanley Park and drove around Stanley Park Drive looking for a great vantage point. I think there are a number of great spots to stake out in the park, but I really like the vantage point near the Harry Winston Jerome (a legendary Canadian sprinter) statue, in the southeast corner of the park, near the totem poles. Give it a shot and send me your best shots.